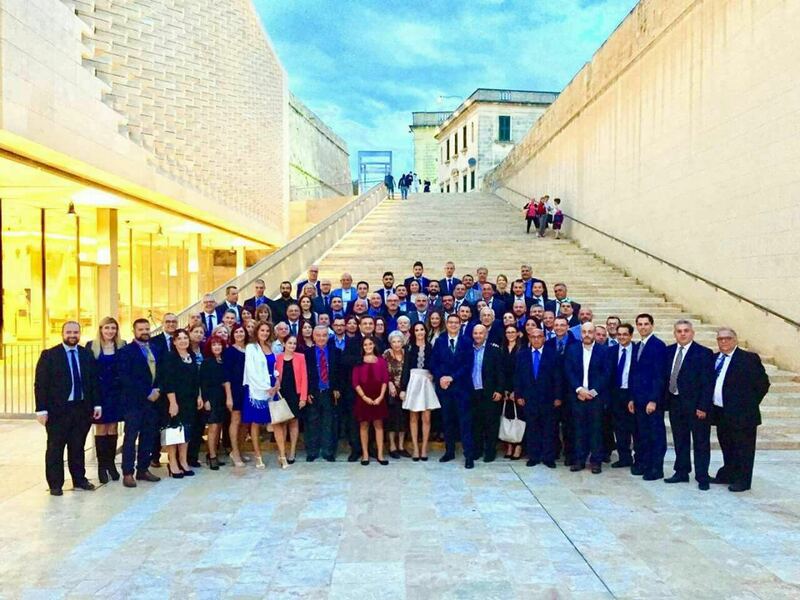 A sizeable party of ‘distinguished’ guests accompanied the Nationalist Party leader, Adrian Delia, when he was sworn in as a member of parliament in violation of the democratic spirit (but since when does the Far Right care about the finer points of democracy?). They included the farcical Kristy Debono, so determined not to have her nose put out of joint by Mrs Delia in the War of the Barbies that she turned up in clunky knee-high platform boots to Mrs Delia’s white cut-on-the-bias miniskirt. Then there was her husband, Jean Pierre Debono, for whom there is no greater love than to give up his seat, who stood by accident or design at the opposite end of the photographic line-up to his life-mate. And of course, there was the thug and retired pimp Censu L-Iswed, all scrubbed up in a blue suit and tie, right there in the front row. Malta is such a special place. Censu L-Iswed, 6th from right in the front row. Kristy Debono is the one in the black knee-high boots, following the grand old Maltese tradition of bringing out the boots with the first of the October rains even when the temperature is in the 20s.